One of my favorite/least favorite things about my apartment is that I have two windows (on two different walls) in my bedroom. So much light gets let in during the day! So much of the safety light outside my window shines in at night… I love putting furniture under windows! All of my furniture is too tall to go under the windows… I get to have twice as many curtains, which I love! 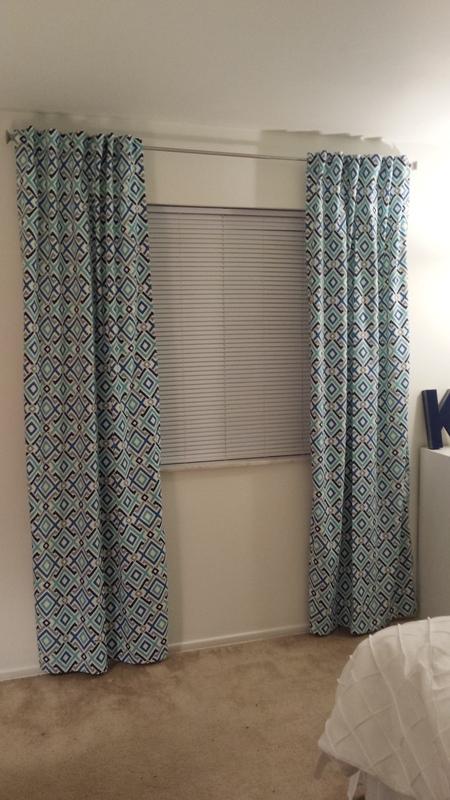 I couldn’t find any curtains that I liked… so I made my own! It took what seems like forever to find fabric that I liked enough to use for curtains. It was a rough search. Either the colors were off (I was looking for something with navy in it), the pattern was ugly (nobody likes ugly curtains). or the fabric was WAY too expensive. One of the reasons I was wanting to make my own curtains in the first place was to save a bit of money, so I was not about to break the bank getting really expensive fabric. 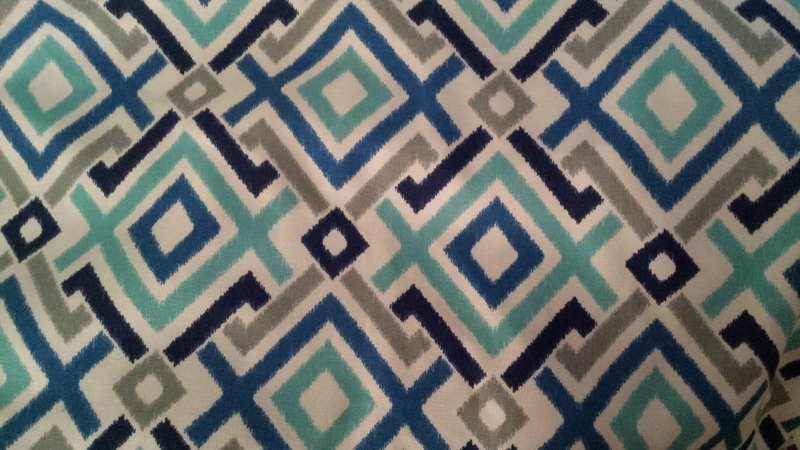 After months and months of looking online and in different stores, I finally found the PERFECT fabric at JoAnn’s! And the price was the best part- I got 12 yards for under $80! That was enough fabric for all four panels! Hooray! I used this tutorial as the basis for sewing my curtains. My mom was awesome and helped me get started, but we made a few changes. We folded over the edges twice for a cleaner edge, and I only used a 1 inch hem at the bottom of the panels (we used 1 inch hems on all three sides, bottom, left, and right). I did use ribbon tabs on the back and I LOVE the way they look! 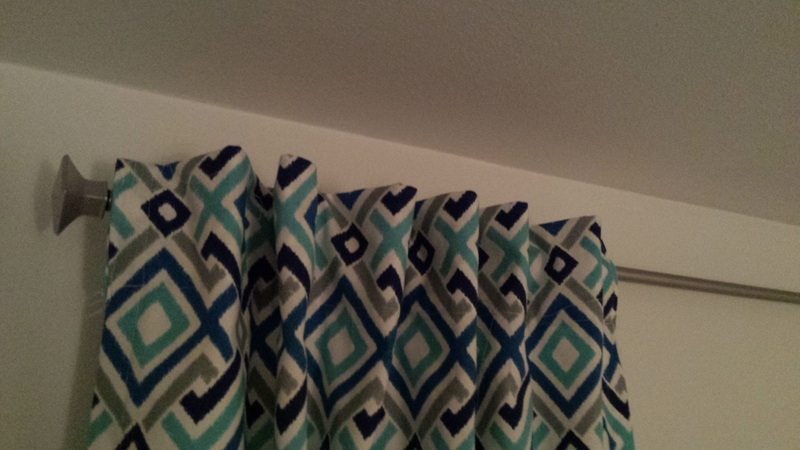 I like the way it makes the curtains stick out on the top… does that make sense? I love the way that these turned out! And they were so easy to make! I have loved using my little sewing machine and I already have my next sewing project planned out! P.S. I apologize for the horrible horrible lighting. It is hard to take pictures of windows when it is light outside, so I waited till it was dark outside and lack of overhead lighting in my apartment makes for awkwardly lit pictures. Oh well, they look good in person and that’s all that really matters to me!